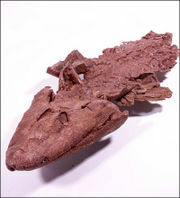 So is Tiktaalik real evidence that fish evolved into tetrapods (four-limbed vertebrates, i.e. 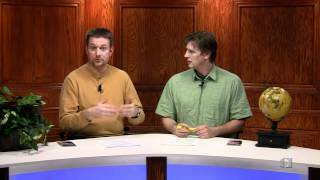 amphibians, reptiles, mammals and birds)? As will be shown, there are parallels with Archaeopteryx, the famous alleged reptile-bird intermediate, but not in the way the above quote claims! 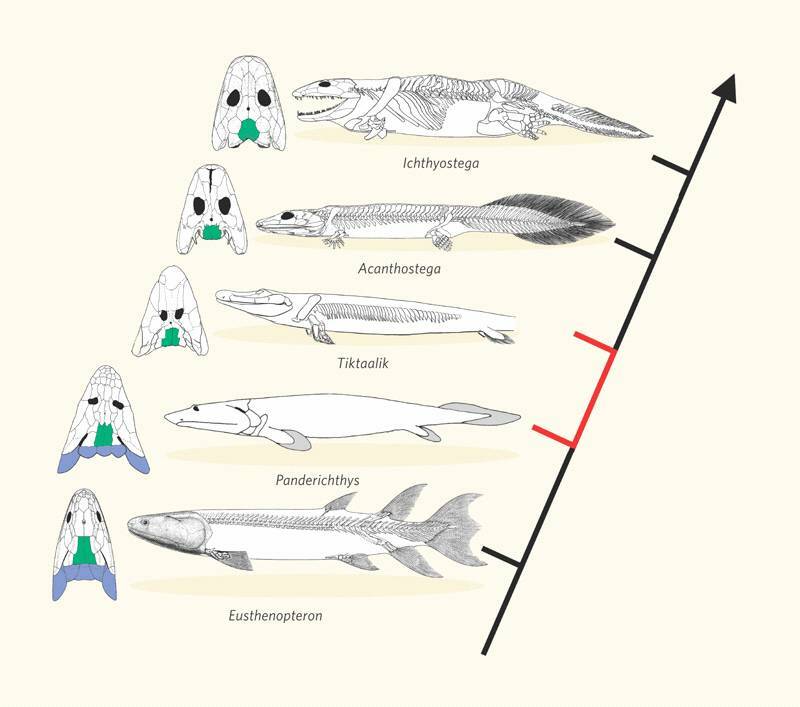 The alleged fish-to-tetrapod evolutionary transition is full of difficulties, explained in great detail in The fossil record of ‘early’ tetrapods: evidence of a major evolutionary transition? In this, it parallels the record of reptile-to-bird, Mammal-like reptiles, land-mammal–to–whale and ape-to-human evolution; superficially plausible, but when analyzed in depth, it collapses, for many parallel reasons. For simpler summaries on the fossil record than the preceding linked articles, see The links are missing and Argument: The fossil record supports evolution. The above quote comes from two leading European experts in the alleged evolutionary transition from fish–tetrapod, Per Ahlberg and Jennifer Clack. It was about the find of well-known American leaders on the same alleged transition, Neil Shubin and Edward Daeschler, and which was the cover story for Nature.2,3 Clack, Shubin and Daeschler even previously featured on the PBS-Nova seven-part series, Evolution, Episode 2: Great Transformations about the origin of tetrapods. Shubin et al. found a 20-cm-long skull sticking out of a cliff. They found that this skull, superficially like a crocodile’s, was part of a fish that had a fin that was supposedly on the way to becoming a tetrapod limb. They ‘dated’ it to 383 Ma (million years ago). Since it was in Ellesmere Island, Nunavut Territory (Canada), it was given a genus name from the indigenous Inuktitut word for burbot, or large, shallow freshwater fish. Indeed, Tiktaalik’s fin was not connected to the main skeleton, so could not have supported its weight on land. The discoverers claim that this could have helped to prop up the body as the fish moved along a water bottom,3 but evolutionists had similar high hopes for the coelacanth fin. However, when a living coelacanth (Latimeria chalumnae) was discovered in 1938, the fins turned out not to be used for walking but for deft manœuvering when swimming. Thus all the claims about Tiktaalik are mere smokescreens, exaggerating mere tinkering around the edges while huge gaps remain unbridged by evolution. Similarly, all the hype about Archaeopteryx and alleged feathered dinosaurs is beside the point while feathers, the avian lung and flight are still an evolutionary enigma. See also Does a ‘Transitional Form’ Replace One Gap with Two Gaps? In fact, when more characteristics than just one are analysed, homoplasies become even more necessary to explain away anomalies, as will be explained in the section Mosaic rather than transitional. Another major problem is that evolutionists appeal to the common pentadactyl 5-digit pattern as evidence for their common ancestry from a 5-digited creature. Yet the nearest creatures they have to a common ancestor did not have five digits! Acanthostega had eight, while Ichthyostega had seven. Fig. 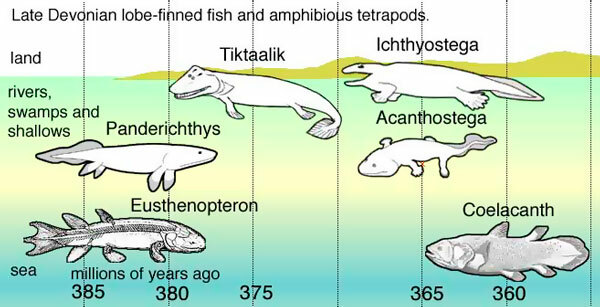 3: Alleged lineage including Tiktaalik, from ref. 1. Click to see larger image. Fig. 3 (right) does much to popularize evolution, but there are a number of problems. The caption admits, ‘These drawings are not to scale, but all animals are between 75 cm and 1.5 m in length.’ If size were taken into account, would there be such a clear progression? Compare a far more extreme example, the supposed land-mammal–to–whale sequence. This was also illustrated as equally sized, but Basilosaurus was 10 times longer than Ambulocetus. Another admission is, ‘The vertebral column of Panderichthys is poorly known and not shown.’ We should remember the Pakicetus fiasco: when a few bones were known, evolutionists drew it like a half-way land-water form. But when more bones were found, it was realized that it was a fast-running land mammal. Fig 4: Lobe-finned fish and amphibians, according to evolutionary order. Click to see larger image. Even more importantly, the order is not right! Compare Fig. 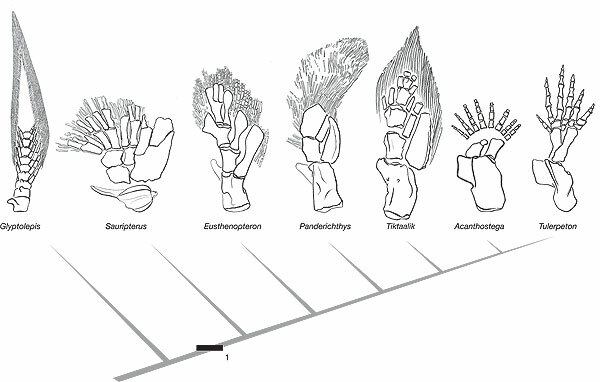 4 (right): Panderichthys is dated earlier than its supposed predecessor, Eusthenopteron. And all are earlier than the undoubted fish, the coelacanth. This is yet another parallel with alleged bird evolution—undoubted beaked birds like Confuciusornis are 10 Ma older than their alleged feathered dinosaur ‘ancestors’. Evolutionists would argue that it is not a problem, for the same reason that sometimes a grandfather can outlive his grandson. This is correct, but one of the major ‘evidences’ of evolution is how the evolutionary order supposedly matches the fossil sequence. So the mismatch of claimed order of appearance with claimed phylogeny undermines the evolutionary explanation. Also, Acanthostega is allegedly a predecessor to Ichthyostega, but they were actually contemporaries. For example, Archaeopteryx has fully formed flight feathers, an avian lung and an avian braincase (which is why the ‘hoax’ claim is indefensible), but had allegedly reptile features like a tail and teeth. Alleged whale evolution also has a number of ‘modules’, as documented in Walking whales, nested hierarchies, and chimeras: do they exist? These creatures with a mixture of characteristics are called mosaics or chimeras. The same is true of the limb pattern as shown above. This is also consistent with a designer who used ‘modules’ of different characteristics. When analyzed in detail, the evidence is consistent not with evolution, but with a particular form of intelligent design. But not just intelligent design in the broad sense, which allows for any sort of designer(s), even aliens (such as the Raëlian cult), and even can allow for evolution (Michael Behe, author of Darwin’s Black Box, accepts evolution, for example). Rather, it supports a particular subset of ID: the biotic message theory, as proposed by Walter ReMine in The Biotic Message. That is, the evidence from nature points to a single designer, but with a pattern which thwarts evolutionary explanations. In this case, the common modules point to one common designer, but evolution is powerless to explain this modular pattern, since natural selection can work only on organisms as a whole. That is, it cannot select for particular head design as such, but only for creatures that have a head that confers superior fitness. But a designer who worked with different modules could create different creatures with different modules, that fit no consistent evolutionary pattern. But as we say, Design is not enough! Nature does not reveal the identity of the Intelligent Designer. Fortunately, the Designer already has. Ahlberg, P.E. and Clack, J.A., Palaeontology: A firm step from water to land, Nature 440(7085):747–749, 6 April 2006 | doi:10.1038/440747a. Return to text. Daeschler, E.B., Shubin, N.H. and Jenkins, F.A., Jr, A Devonian tetrapod-like fish and the evolution of the tetrapod body plan, Nature 440(7085):757–763, 6 April 2006 | doi:10.1038/nature04639; see abstract. Return to text. Shubin, N.H., Daeschler, E.B. 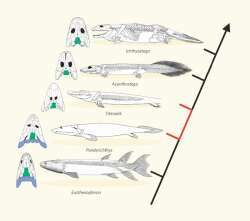 and Jenkins, F.A., Jr, The pectoral fin of Tiktaalik roseae and the origin of the tetrapod limb, Nature 440(7085):764-771, 6 April 2006 | doi:10.1038/nature04637; see abstract. Return to text. 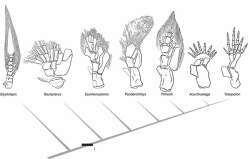 Clack, J.A., Gaining Ground: The Origin and Evolution of Tetrapods, pp. 17–18, Indiana University Press, Bloomington, 2002. Return to text. Cited 24 June 1998, CNN website . Return to text. Gudo, M. and Homberger, D.G., Functional morphology of the coracoid bar of the Spiny Dogfish (Squalas acanthias): implications for the evolutionary history of the shoulder girdle of vertebrates, 43rd Annual Meeting of the Palaeontological Association, Manchester, 19–22 December 1999; , 4 April 2003. Click on ‘Abstracts’ then ‘Manchester 1999’. Return to text. Luckett, W.P. and Hong, N., Phylogenetic relationships between the orders Artiodactyla and Cetacea, J. Mammalian Evolution 5(2):130, 1998. Return to text. Gao, K.-Q. and Shubin, N.H., Earliest known crown-group salamanders, Nature 422(6930):424–428, 2003. Return to text. Wise, K.P., The origin of life’s major groups; in: Moreland, J.P. (Ed. ), The Creation Hypothesis: Scientific Evidence for an Intelligent Designer, InterVarsity Press, Downers Grove, pp. 211–234, 1994; esp. p. 227. Return to text. Ichthyostega spp., Devonian Times, accessed 11 April 2006. Return to text.